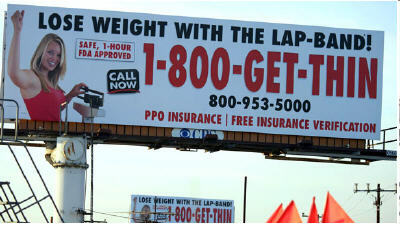 One of the ubiquitous L.A. billboards advertising lap band surgery. 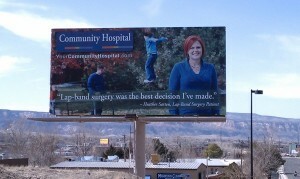 Billboards showing up across the U.S. encourage people to shed extra pounds by undergoing lap band surgery. The ads leverage people’s insecurities about their weight to drive them to an expensive and risky surgical solution. A particularly aggressive lap-band billboard campaign has plagued image-conscious southern California for months. 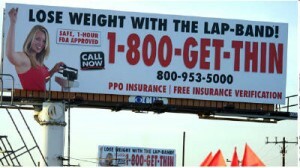 Huge ads along L.A. freeways screamed, “Lose weight with the lap-band! Safe, 1-hour, FDA-approved. 1-800-GET THIN”. The ads made lap-band surgery sound fast and easy. They were also practically inescapable. One L.A. freeway had 25 lap-band billboards in just a four-mile stretch, and the boards were up for months alongside most of southern California’s freeways. They bore no information about the qualifications needed for the surgery, or the risks it poses — not even in fine print. People who dialed 1-800-GET THIN heard an automated greeting from a “celebrity physician” assuring them the lap band is approved by the FDA and is “extremely effective” at helping people lose weight. But just like the billboards, the telephone recording didn’t mention any risks, contraindications or qualifications to get the surgery. In addition to the ubiquitous billboards, 1-800-GET THIN ads also appeared in newspapers, on bus placards, on TV and the Internet, featuring people who claimed to have shed huge amounts of weight and regained control over their lives through lap-band surgery. Many people who called 1-800-GET THIN found they got more than they bargained for — way more, and not in a good way. Laura Faitro was one of those people. Ms. Faitro underwent the lap band surgery after calling 1-800 GET THIN. The procedure was performed in a day-surgery suite of an office building, and her insurance covered just $3,000 of the $12,200 cost. During the procedure, her doctor lacerated her liver and called other doctors in to assist him. He discharged Ms. Faitro shortly after her surgery, even though she complained of severe abdominal pain. Soon after the doctor sent her home, she had to go to the emergency room for her abdominal pain. Five days later, Ms. Faitro was dead from “multi-organ failure due to shock secondary to bleeding and sepsis” in her abdominal cavity. Her husband, John Faitro, recently filed a class action against the surgery centers that advertised the procedure. But why a class action if this was an isolated case? Because it’s not an isolated case. Laura Faitro is one of at least five southern California patients who lost their lives after responding to the 1-800-GET THIN ads and having lap-band surgery done at one of the clinics affiliated with the ad campaign. The clinics were operated by two doctors, Michael and Julian Omidi, brothers affiliated with a Beverly Hills medical business called TopSurgeons. Investigation later revealed that Julian Omidi’s medical license had been revoked after the California Medical Board found he had lied on his license application. He omitted information from his application that would have led the Board to discover that, while attending the University of California at Irvine from 1986-1990, he had been expelled over his involvement in the burglary of exam papers. The California Medical Board also sanctioned Julian’s brother, Michael, with three years’ probation for gross negligence in his treatment of liposuction patients in 2005. Michael Omidi had improperly administered anesthetics, and allowed unlicensed staff to suture up patients and even perform liposuction. In December, 2011, FDA took action against 1-800-GET THIN-affiliated clinics and their misleading ad campaign. That same month, FDA issued a warning to consumers about the fraudulent lap band surgery ads, and the risks and side effects of such surgery. FDA has also issued warning letters to advertisers about misleading lap band surgery ads. In February, 2012, Allergan, manufacturer of the lap-band, announced that it would stop selling the device to surgery centers affiliated with the 1-800-GET THIN ads. On February 8, 2012, the Los Angeles Times reported on a whistleblower lawsuit by two former surgery center employees who allege that clinics affiliated with the 1-800-GET THIN ads operated unsanitary surgical facilities and padded their bills with extra charges for medically unnecessary procedures and surgeries they never actually performed. Despite the lap-band surgery debacle unfolding in California, the multiple deaths associated with the lap-band and FDA’s growing number of warnings about lap-band ads and about the procedure itself, direct-to-consumer advertising for lap-bands is now spreading throughout the country. Messages pushing the surgery are targeting weight-conscious consumers across a range of media. On January 26, 2012, for example, an NBC TV affiliate in Grand Junction, Colorado, ran a completely uncritical local TV news story about lap-band surgery. The report focused on a single patient who so far has suffered no ill effects from the surgery. Like the ads that flooded L.A., the NBC story failed to mention any potential side effects, risks, qualifications or contraindications for the surgery, or FDA’s ongoing sanctions against advertisers for misleading ads that make the procedure sound quick and simple. Nor did the report mention lap-band patients’ deaths. Coincidentally, the NBC news report appeared at the same time billboards started showing up in Grand Junction promoting lap-band surgery. While the ads are less aggressive than California’s, they still lack any warnings about the risks or side effects of the procedure, as required by FDA. A call to the reporter at the Grand Junction NBC affiliate who did the lap band story said she was unaware that billboards promoting the procedure had gone up at the time she did the news report, and insisted the idea for the story was entirely her own. FDA continues to post consumer updates on the serious risks and side effects of gastric bands. They also post information about serious patient complaints about lap-bands, like this one, where a lap band slipped and left “three quarters” of the patient’s stomach “in a necrotic state.” The patient complained of throwing up for days, got dehydrated, and developed a rapid heart beat. It wasn’t until emergency surgery was done that doctors discovered her lap-band had slipped. So far, advertisers have ignored FDA requirements that they make people aware of the dangers and side effects of bariatric surgery. That could be intentional. If they perform this type of operation purely as an elective surgery on people who don’t fit the medical qualifications, the surgery must be paid for out of pocket, without the involvement of insurance companies. That makes the procedure a cash cow for surgical centers and doctors who perform it, which explains the ubiquity of the ads promoting it. Granted, lap band surgery has the potential to greatly benefit some people who are medically qualified for the procedure and who work with reputable doctors to have the surgery done properly, with appropriate follow-up care. But common sense dictates that the right way to decide to undergo a risky surgical procedure is not from reading roadside billboards put up by ruthless doctors who care more about money than patient care. Every surgical procedure has risks. Before considering gastric surgery, people need to do a lot of homework, ask a lot of questions, and thoroughly weigh the pros and cons. Lap-band surgery should draw even more scrutiny because of the insidious and dangerous way it is being marketed to large numbers of clueless people — many of whom, like so many of us, are undoubtedly insecure about their weight, and lack a medical education.